Top Quality Gold and Silver Rutile included Clear Quartz point, with a some lodalite inclusions and a lovely little light-bearing rainbow at its tip. Absolutely delightful, and brimming with energy. Rutilated Quartz is said to have the perfect balance of Universal light. 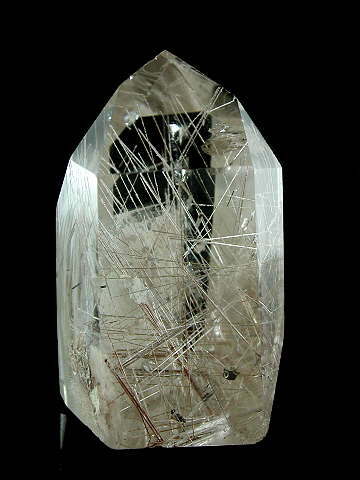 The rutile (strands in the Quartz) can be gold, red or more unusually, silver. This one is unusual in that it has a beautiful balance of both gold and silver. With the evolution of our chakras post-2012 and the new wave of energy that can now be accessed, this combination and balance of gold and silver/platinum rutile vibrates perfectly with the new chakra energies and colours. Lodalite is a type of minaral included Quartz; most often, but not limited to, Iron and Calcite. These lovely inclusions give the impression of looking at a rocky or coral seabed through a glass-bottomed boat. Some also look like landscapes captured in Quartz, or a kind of underwater garden. This particular specimen has some small white floating calcite lodalite inclusions, in addition to some partial phantoms at one edge - beautiful! Rutilated Quartz promotes spiritual growth and development and is said to aid astral travel, channeling and clairvoyance. It connects us to the highest spirit guidance and draws off negative energy. The latter makes it of particular use to healers and therapists, as not only does it draw out negative energy, but it supports the aura during this emotional release. Just sweeping a piece through the aura is enough to start drawing unwanted, dark energy out. The silver or golden rutile inclusions also offer protection from psychic attack, so this is a very useful crystal to have or work with.